We love stuff with tomatillos. Salsas, chile verde, and sauces. 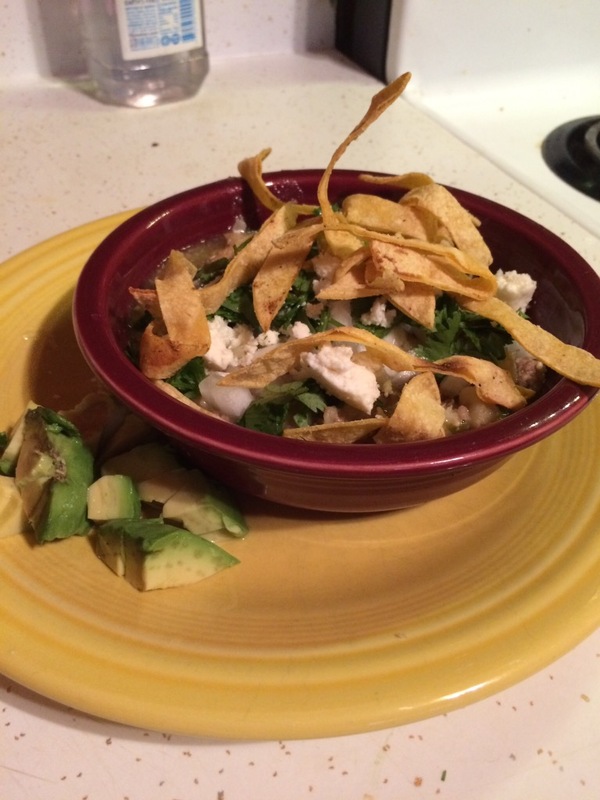 I had never made green posole before, in fact I did not even have a name for it until a high school student said, “oh you’re talking about green posole”. So, I guess it has been made before. This is an easy, tasty dish. Perfect for the upcoming cooler weather; Or even a football night. Just a few ingrediants are needed. But it takes a few hours to cook. The night before or in the morning soak the posole in salted water. This will soften it up before cooking begins. Toss that water before using. Remove outer leafy layer on the tomatillo, quarter them and place in a large sauce pan. Add salt and water, cover and cook over medium to medium high until soft. About 30 minutes. Meanwhile in a medium to large stock style pot add the chicken stock/broth and the posole, turn up the heat to get it to boil, this way it will start to cook. Brown ground pork with cumin. When finished drain and add to posole mixture. Tomatillos should be soft at this point. If you have a wand blender use that to cream the tomatillos, careful it is hot. If not let cool just a bit and place in a blender to cream. Add to posole and pork mixture.Stir then cover and simmer for a few hours or until posole is tender. Before serving chop cilantro, onions and break up cheese. Slice the lime for squeezing. Cut the tortillas in thin strips, using your broiler option on the oven place on a cookie sheet then under the broiler tossing with tongs every couple of minutes until nice and golden brown.